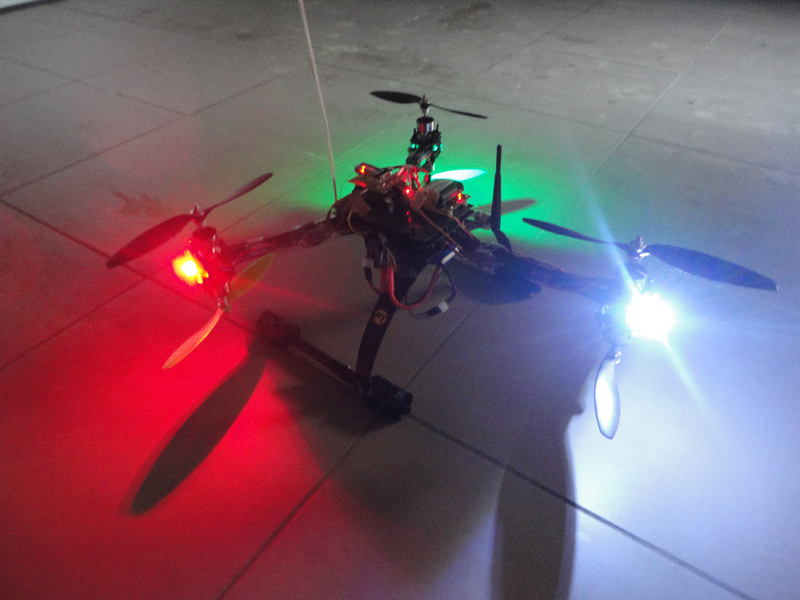 Today I finally mounted and tested my LED strobe lights with my DiyDrones APM 2.5 board. 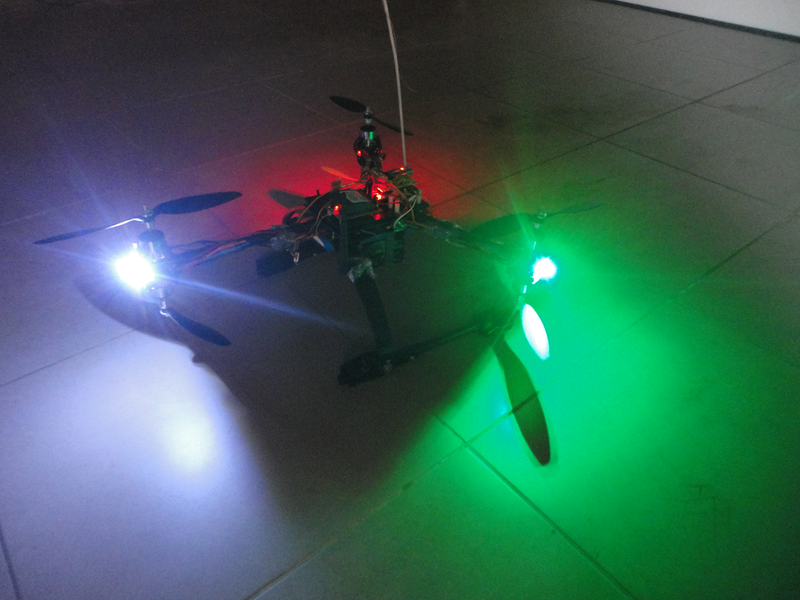 On this corn led 5 indiviual leds are mounted. The corn led needs 12v to work. For RC users this means you need to connect it to a 3 cell lipo battery. 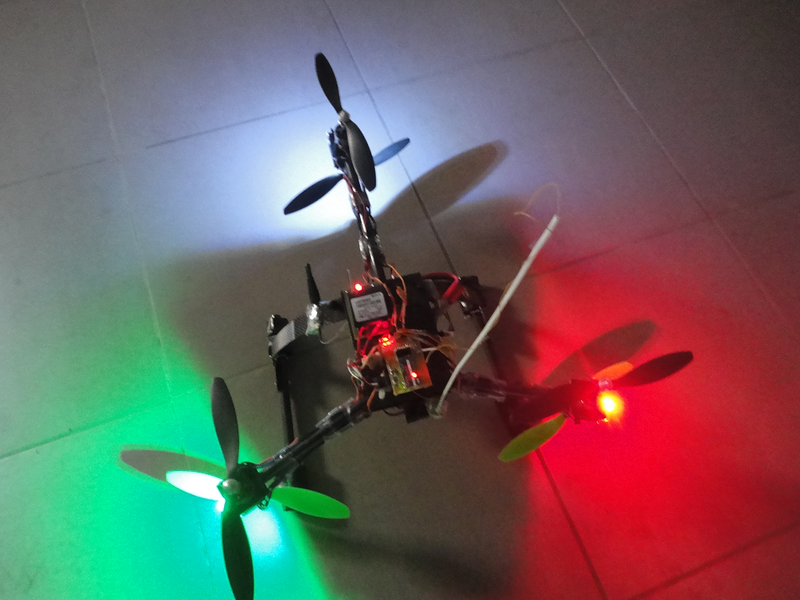 The corn led will NOT work when connected to a 2 cell lipo. The corn led consumes 1 watt. So you can NOT connect is directly to the apm flight control board. 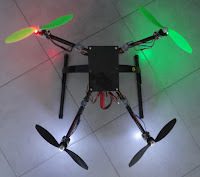 You can just connect them directly to the lipo battery but the you have no APM signaling. If you would like to connect them to the "arm signal pin" or the "navigation signal pin" you need some extra resitors and transistors to drive the led's. See shematic below. Pay attention to the polaristion of the corn led's they have a + and - pin. Remove the plactic cap (just slide backwards) to see which pin is + and - . On my setup I connected 3 corn leds to the arm pin. 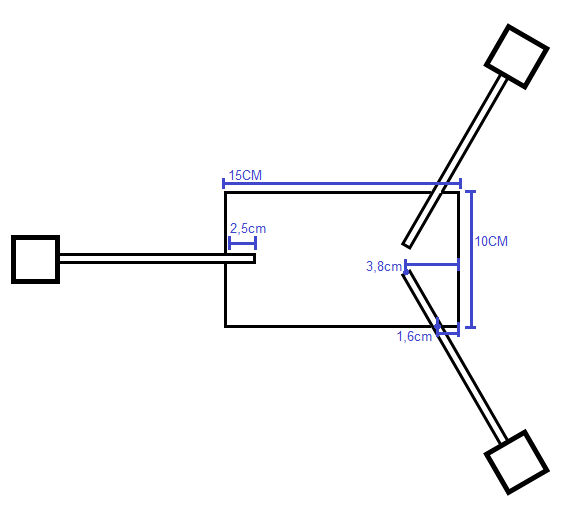 So i need one 1K resistor and 3 x BC547C transistor. You should be able find these common and very low cost electronic components in almost every diy electronics shop. During winter I made a little breakout board that I mount directly on to the APM 2.5 board. On this breakoutboard I have soldered a voltage diver that is connected to the APM voltage sensor pin. On this board I also soldered some kind of plug-in slot for my analog RC module. Now the RC module is connected to the APM without any cable. I also mounted the Hobbyking HD Wing CAM. The Y6 is flying stable and smooth. But the MAG is currently disabled because of EMF noise comming from the motors. This also influences the video capturing. I can easely fix this by extending the motor arms. But this makes my Y6 larger. 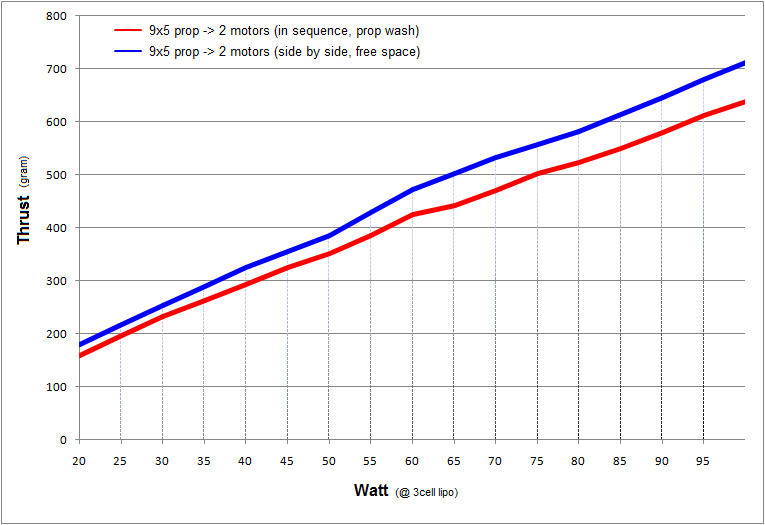 When I have the time I'll try to benchmark this to find a save min distance between APM and this type of motor. 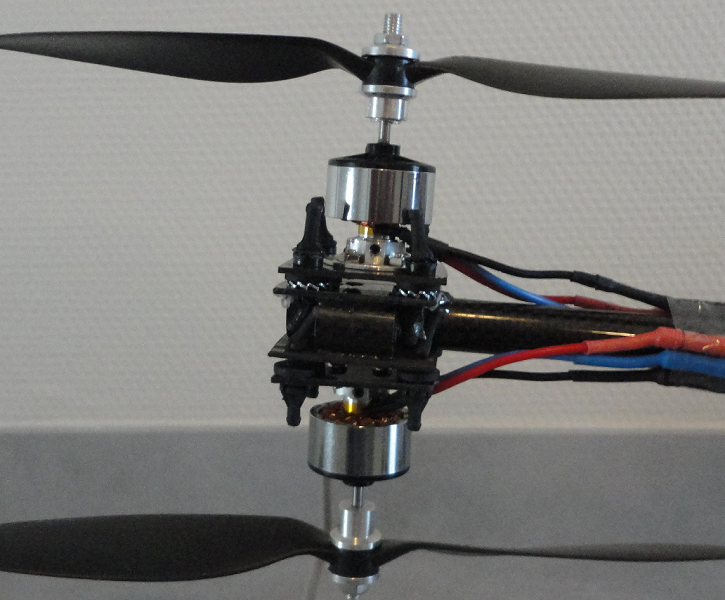 And a little video to show that this frame fly's well. It's not a high power acro setup. But it still has ~ 3 to 1 thrust/weight ratio. You feel that on take off. It needs less then half throttle to lift off and hover. So here it is. 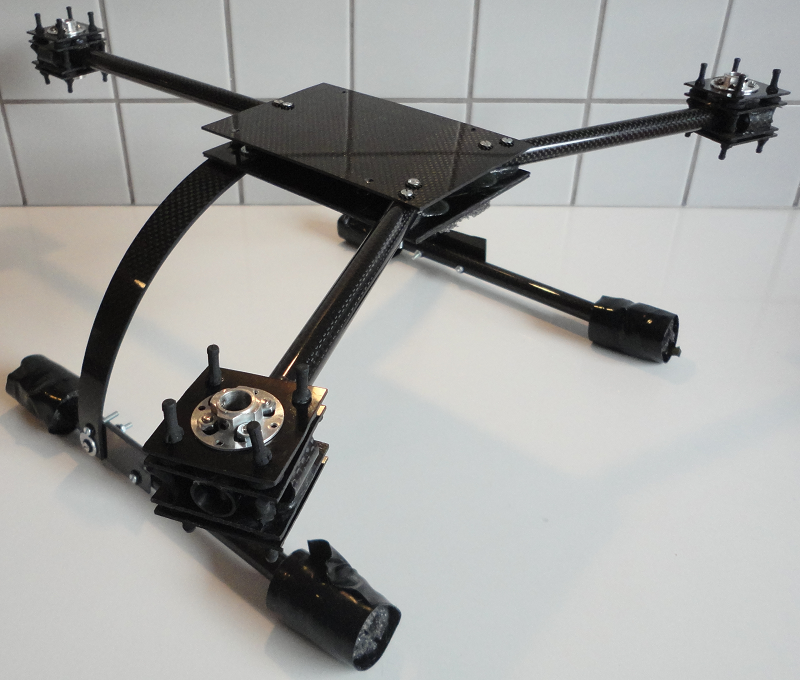 The full carbon Y6 frame. It's simple to make. Now glue the top plate on top of the arms. 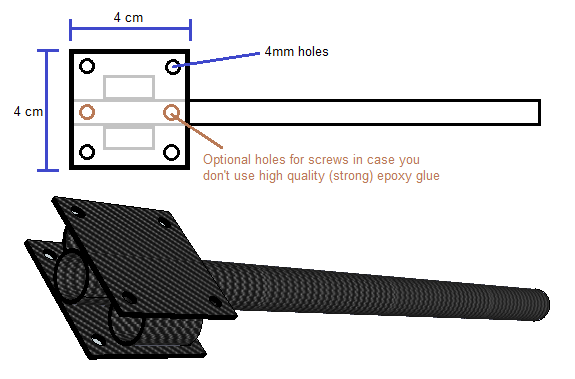 As top plate I used a 150mm x 100mm x 1.5mm carbon fiber plate. When you used high quality epoxy then this frame will be strong enough. If you do not have configence in the glue you used then drill some 3mm holes from top plate trough the round tube trough the bottom plate and add some screws. I also drilled 4 holes in the top plate where I'll put anti vibration rubbers. All my electronics will be mounted on a second topplate. 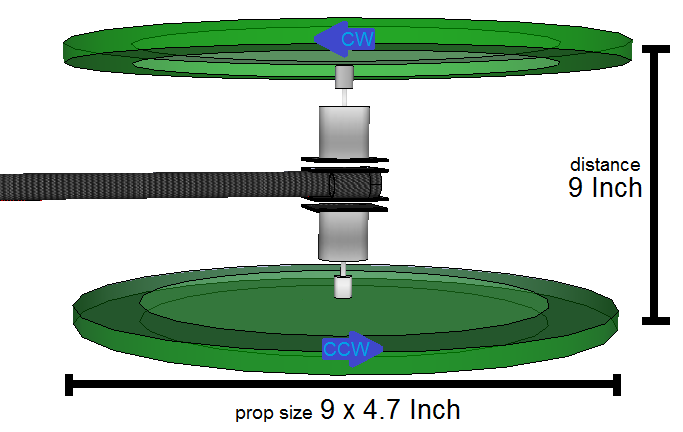 This will reduce vibration but will add extra weight. It is an optional feature. The landing gear. 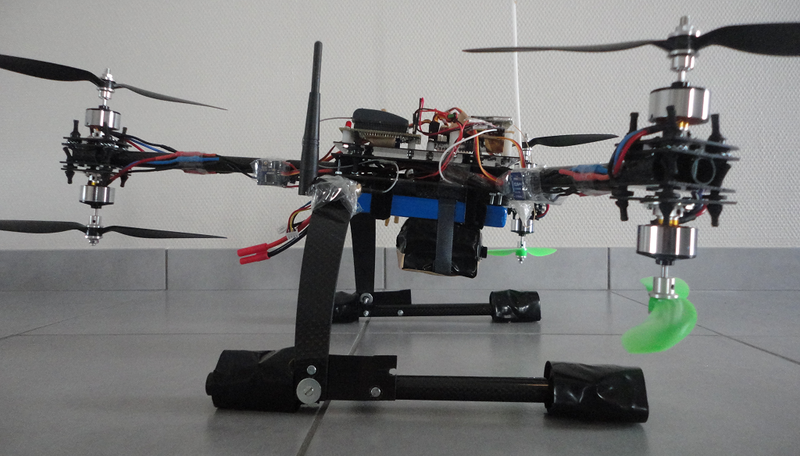 I wanted to keep the total weight of the landing gear below 100 grams. 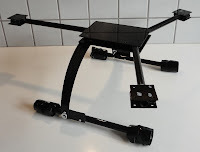 I have looked arround and the only options was a combination of carbon round tubes I used for the arms and an general airplane carbon landing gear. The landing gear is PT-Model 1300 and is rated to 1.3kg. As the total weight of my Y6 will be 1.3 ot 1.4 kg this landinggear should be enough for soft landings. As in prevouis steps I first glue all parts togheter with 30min epoxy. When the epoxy is hard I drill some 3mm holes and make is stronger with screws. Fix the landing gear on to the bottom plate of the frame. I drilled 4 x 3mm. When this is mounted it should look like the photo at the left. 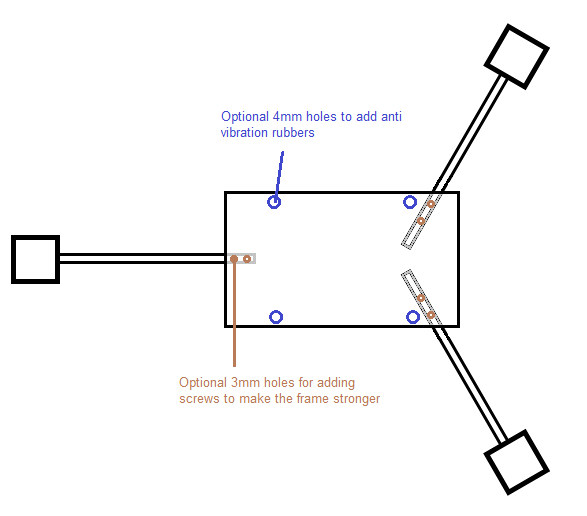 This is a little how-to guide for making your own cheap motor mounts for round tubes (arms) with vibration absorbtion. 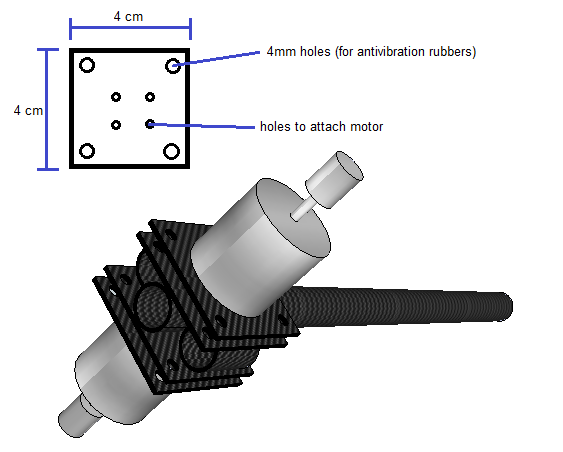 Keep in mind that this motor mount is made for a AX-2210N brushless motor. 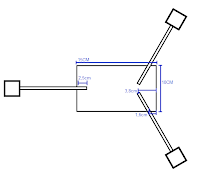 It will use a mounting plate of 4x4cm. Take the arm and glue 2 short pieces of the exact same tube. 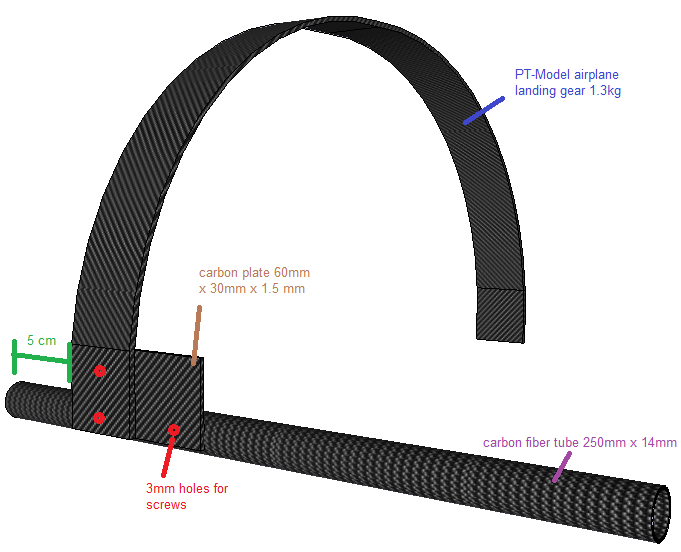 I use 14mm carbon tubes but you can do it with alu tubes as well. If you have high quality (very strong) epoxy than you can just glue everything togheter. If you do not have epoxy or medium quality glue then glue the parts togheter and add some extra screws in the next step. Make 2 plates 40x40x1.5 mm and drill 4mm holes in the corners. 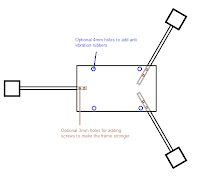 If you only use one motor per arm in you project you can just glue one plate on top of the arm. In my project I use 2 motors per arm so I glue one plate on top and one on the bottom. When you do not have high quality epoxy then wait until the glue has dried out and then drill 2 extra holes to add screws to make the motor mount stronger. Make a new plate 40x40x1.5 mm and drill 4mm holes in the corners. These holes are used to place the anti vibration rubbers. Then drill holes in the center of the plate to attach your motor to this plate. Fix/screw the motor to the plate. Mount the antivibration rubbers to the plate and then attach the plate via the antivibration rubbers to the arm as created in step 2. Finally it should look like this. + lightweight, the 2 short pieces of extra carbon tube, the 2 carbon plates and the anti vibration rubbers are only just several grams all togheter. 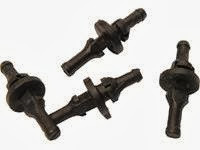 - parts are glued togheter, so you can't replace or change individual pieces. 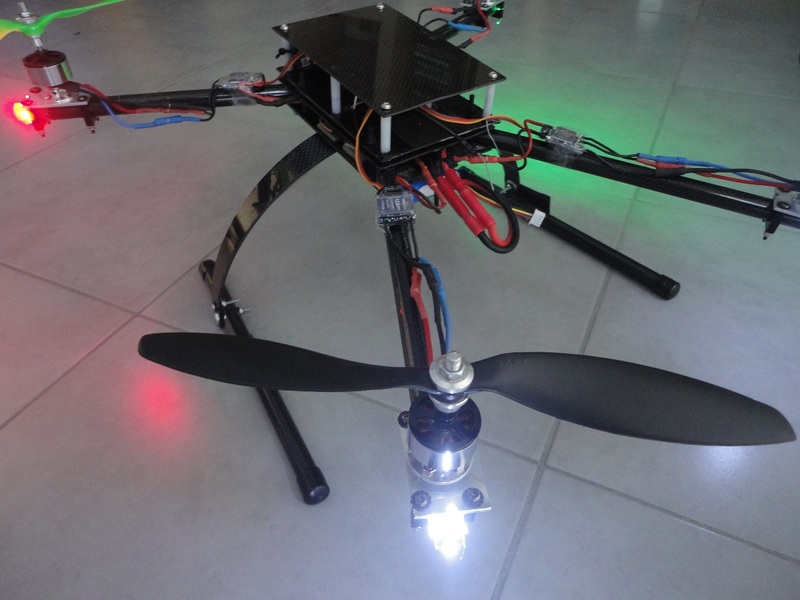 One of the differences between a normal hexa copter and a Y6 copter is the thrust efficiency. 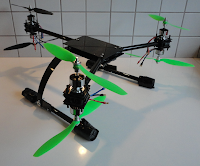 On a hexa copter motors are placed side by side. They do not interfere each other and deliver maximum efficiency. 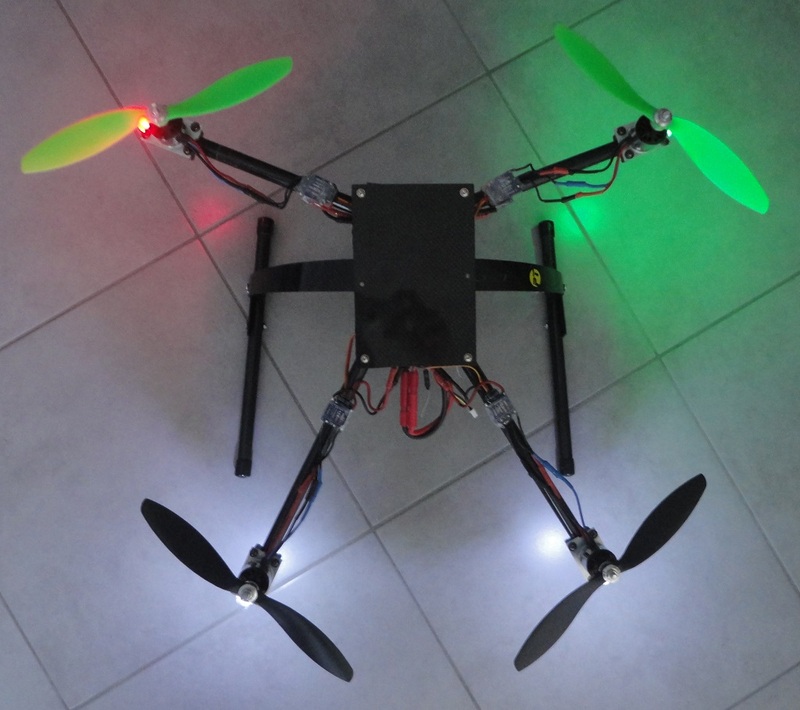 On my Y6 copter I use 9x4.7 inch props. The distance between the top prop and the bottom prop is also 9 inch. As you can see on the graph I got a 10% efficiency loss for this setup. That is an acceptable result. My Mini-H Quadcopter project is closed. 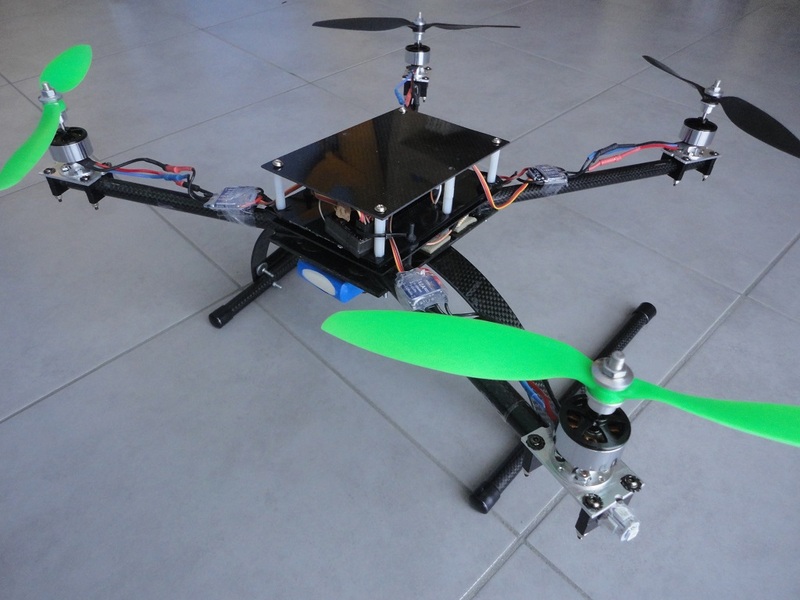 I'm currently using this quad to learn to fly by FPV with my fatshark goggles. 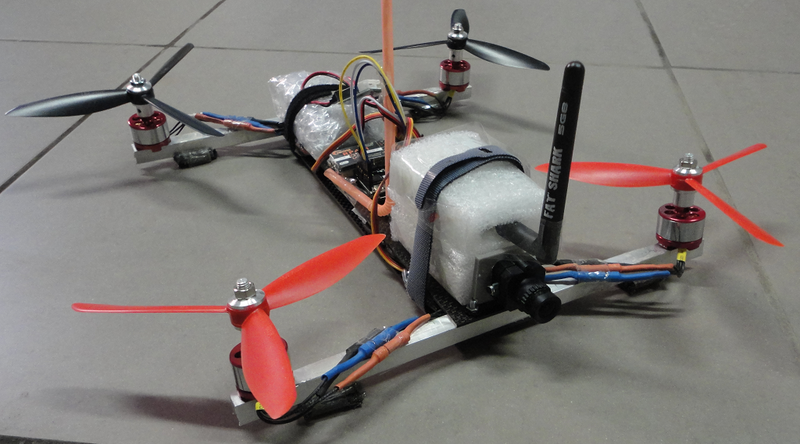 I'm also closing my other quad project . This was a great platform to learn, practice and test. 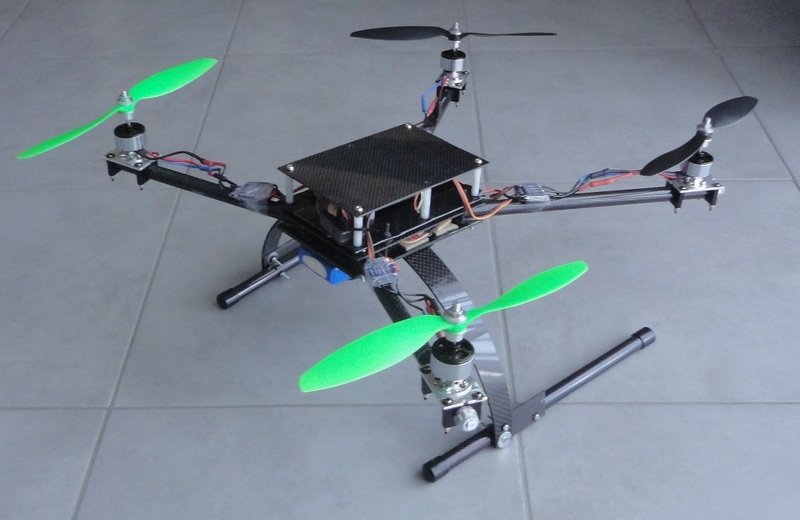 But it's a very strong, but heavy setup and adding an FPV cam to this setup would make it to heavy. So I'm starting this new project. 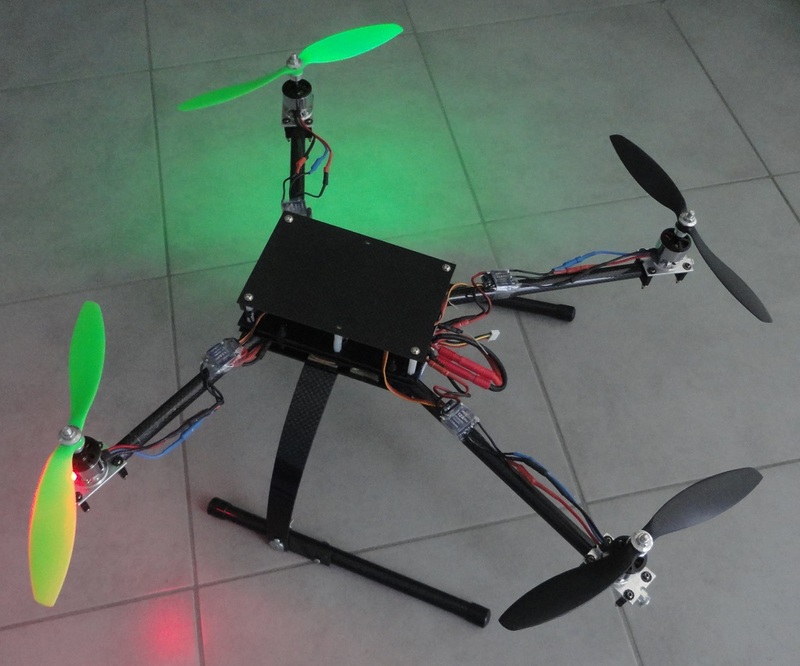 A Y6-Copter. 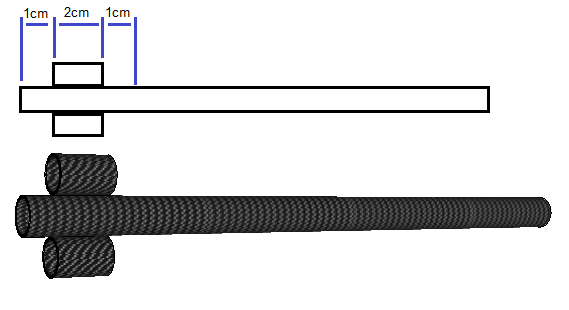 Full carbon frame to make it light and strong. The 6 motors will give me enough lift to carry all electronics and FPV equiment. 6 motors should also prevent a crash when one motor fails in flight.